It’s easy now to forget that the National Theatre was created in two parts. While the company turned 50 back in 2013, its South Bank home celebrates its 40th anniversary this year: the first performance in the Lyttelton was in March 1976, the first in the Olivier in October the same year. The building had a difficult and protracted birth. With theatre construction in the UK disrupted by two world wars and their aftermath, the through-line back to architects such as Matcham and Sprague, who created the country’s beautiful traditional theatres, had been broken. The National’s chosen architect, Denys Lasdun, sat with a distinguished committee of leading theatre practitioners of the day, trying to work out anew exactly what constituted a good theatre. The result was the Lower Theatre, a cinema-generation pros arch with the audience sitting entirely straight-on to the stage across two levels, and the larger Upper Theatre – “a stage in the corner of a room”, to use Lasdun’s summary of Olivier’s desire to be embraced by the audience yet still able to command every member of it. The theatres were to be kept busy, with a desire to perform in rep, potentially two different shows plus a third rehearsing in each theatre, every day. Charged with the practical details of making this work was Richard Pilbrow, who had become Laurence Olivier’s lighting designer and, as a result, was asked to join the building committee to offer a backstage point of view. 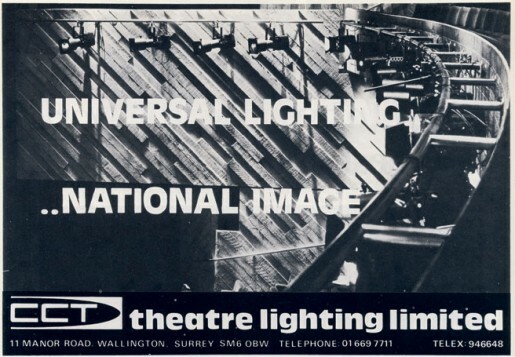 When it became clear that someone needed to provide a formal link between the architect and the practical requirements of the theatre, he and his company Theatre Projects became the National’s theatre consultants. 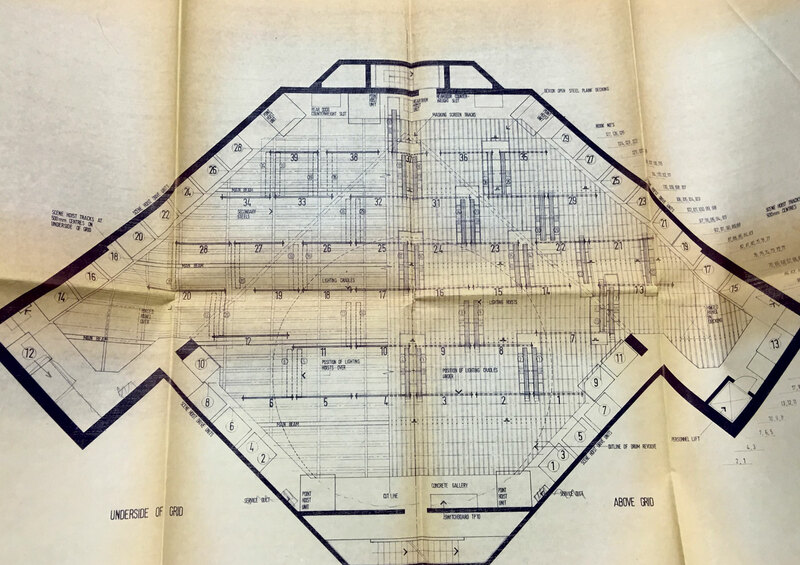 Perhaps the first innovation TP brought to the project was to adopt a role that would now be thought of as theatre planners rather than simply technical theatre consultants. A defining architectural feature of the building, the unique shape of the Olivier flytower was first sketched by Pilbrow for Olivier, who passed it on to an extremely irritated Lasdun, the new ‘ear-like’ corners defined by the auditorium’s extreme sight lines. They then worked out how to equip the theatres in spectacular style. TP’s initial project report noted that “it has long been the tradition in English theatre that the artist should be suspicious of an excess of technology”. Pilbrow, always – even today – the innovator, clearly decided it was time, and perhaps a once-in-a-lifetime opportunity, for a different approach. 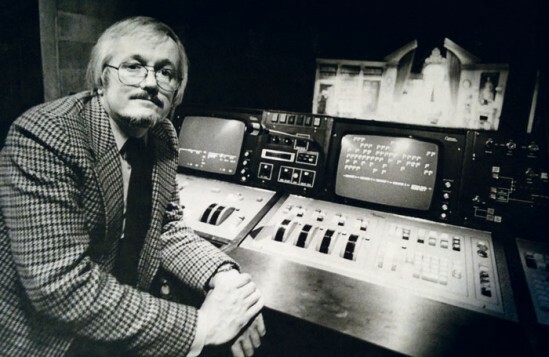 To help, he recruited Richard Brett, a life-long friend, from his studio engineering job at the BBC. Between them they analysed the problems, scoured the world for solutions others had found to similar problems – and, where none existed, invented their own. 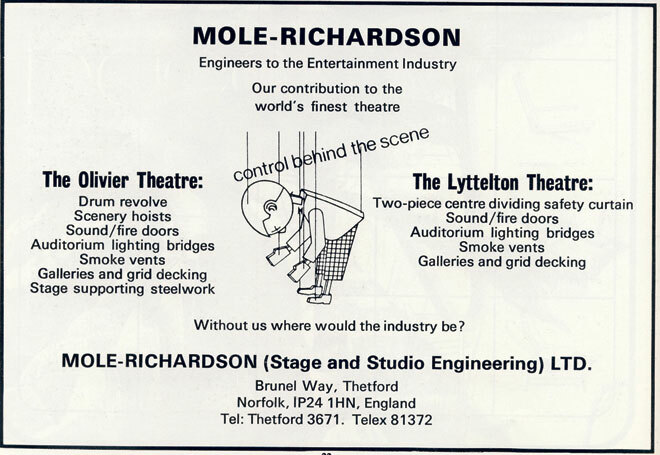 In the Lower Theatre, which would become the Lyttelton, innovations allowed the proscenium area to be as flexible as possible, creating a stage with an adjustable rake, and providing side and rear stages for storage of rep shows. 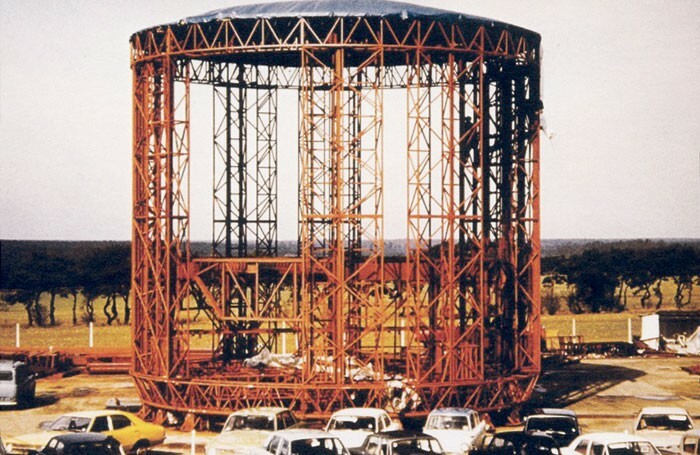 A motorised flying system was proposed, but ultimately replaced by traditional counterweights. A ‘saturation’ lighting rig was designed, with most of the lights permanently focused but allowing some to be refocused between shows. Where possible, the lights were accessible on bridges, and the rig featured the new CCT Silhouette zoom profile with a ‘rep’ removable shutter cartridge. The sound system, specified by Pilbrow’s TP colleague David Collison, was also state-of-the-art for its time: a studio quality mixer with the added ability to route sound to multiple outputs around the theatre. 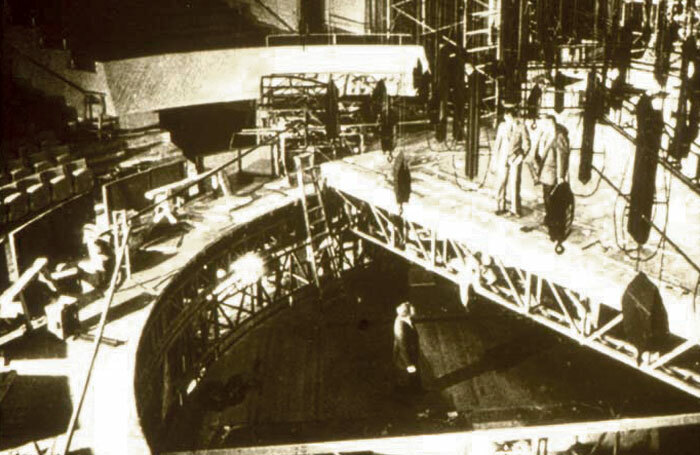 In the Upper Theatre, the Olivier, a key challenge was how to change scenery positioned downstage. Pilbrow and Brett examined many options, including a famous revolve containing a square elevator at the Burgtheater in Vienna, but that still didn’t quite solve the problem. 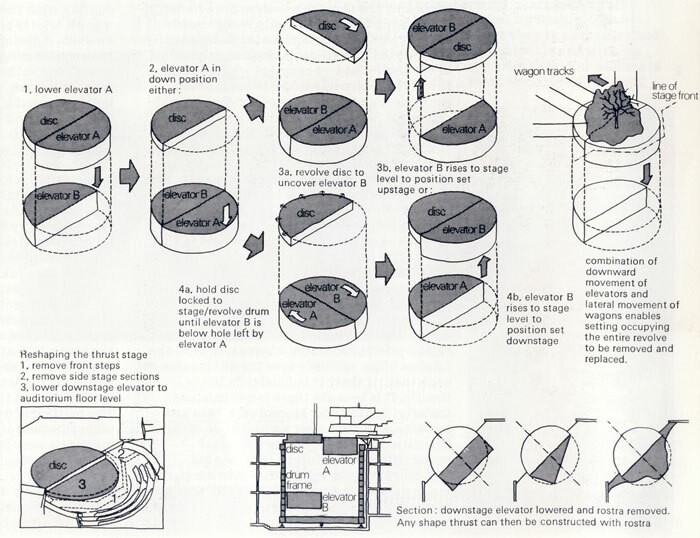 Brett eventually took a napkin, drew a circle on it then put a line through its centre: the ‘theta drum’ revolve was born, a three-storey high ‘tin can’ containing two semi-circular elevators that could rise or fall as the entire structure rotated. Above them was another semi-circular platform to allow the performance to continue while the scenery changed around it. Above the stage, traditional flying bars running straight across the stage felt too limiting. Instead, Brett devised a system effectively consisting of sky-hooks – 153 individual direct-lift point hoists on tracks that could be synchronised to silent cyclo-converter drives, giving a flexible system capable of lifting 3D scenery set at any angle. 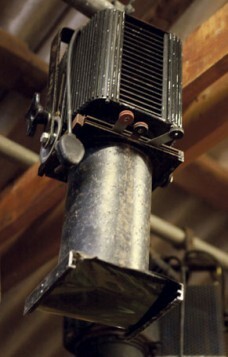 The Olivier, too, had a state-of-the-art sound system and a saturation lighting rig, with the addition of 12 moving lights rigged on short TV-style hoists, since it was felt the overhead rig would often be set too high to focus using a tallescope. This and the sheer number of dimmers in the theatre – more than 600 – was beyond the capacity of existing lighting controls. Pilbrow saw the opportunity to create a new console that could “extend the boundaries and possibilities of stage lighting”. Brett took those dreamy desires and formulated them into a precise spec. The console was nicknamed Total Control System, before eventually being christened Lightboard. 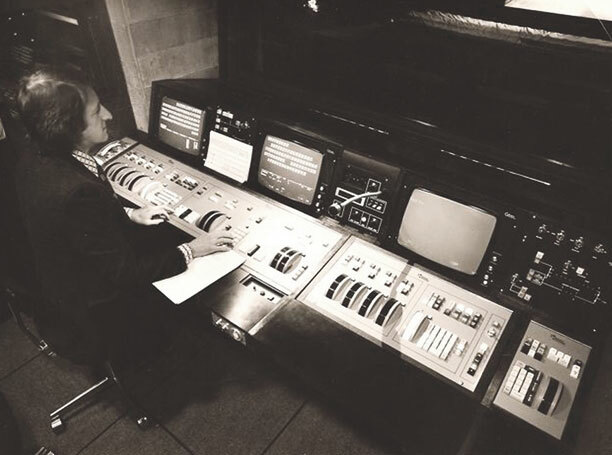 Like much else at the National, it existed right at the edge of what was possible with the technology of the day. 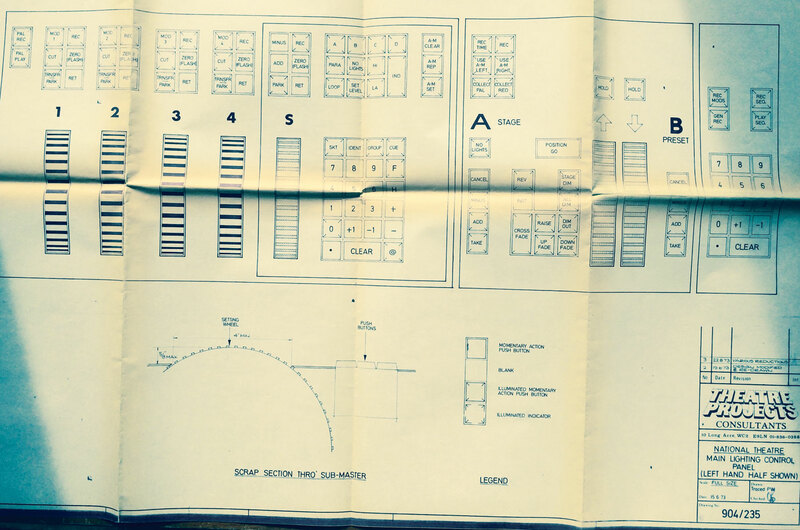 The Olivier lighting hoist layout. Click to enlarge. Amazingly, in a project that often ran into complaints of profligate spending – as so many big public projects do – Pilbrow found support for these innovations at all levels. He admits now: “I never quite understood who actually approved anything. Of course the South Bank Board approved all contracts with us, and everything went through formal approval to the Treasury, but I never remember anyone querying any principles of design.” But he does note that the contractors chosen were often the lowest, rather than most experienced, bidders. That’s the danger of living at the cutting edge. Once the building came to life, finding the time to resolve the problems became a challenge. Work continued in overnight sessions for months, sometimes years. Ultimately, almost everything was made to work, the drum revolve bursting spectacularly into the public eye in William Dudley’s design for The Shaughraun. The Olivier’s power-flying gave good service too and was only replaced during the National’s recent refurbishment project. Alongside the dramatic innovations were a host of others since adopted everywhere: sensible lighting bridges; facilities panels grouping together lighting, sound and other connectors; centralised control of worklight; and multichannel comms headsets, which Pilbrow hoped would “do something to save the time, irritation and screaming” during the “fraught and emotional business” of staging new shows. Plus of course there’s the third theatre, the Cottesloe – which returned to the project at the last minute and was ultimately designed by TP’s Iain Mackintosh rather than Lasdun – a courtyard theatre much admired and emulated around the world. Originally equipped with less technology than the other auditorums, it has also received an upgrade, with a new seating system – and also a new name, the Dorfman. 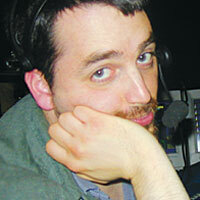 All the recent upgrades were overseen by a new generation of theatre consultants, Charcoalblue. Pilbrow remains unsure of the design of the two main theatres as performance spaces, feeling they lack the actor-audience connection and intimacy that he came to understand on projects after the NT. But all three have now played host to several generations of remarkable shows, well served by the original technical innovations and by the many evolutions and refinements to them that have come in the 40 years since. The Green Room: Should understudies be allowed to tweet their show dates?